Casumo was launched in 2012 and designed “from the ground up to make people smile”. There’s no joking about security, though; the Malta Gaming Authority and the UK Gambling Commission make sure this is a safe place to play at and the operator treating visitors fairly and respectfully. Members get to place bets on a variety of slots, table games and live dealer games provided by multiple suppliers, participate in Reel Races which run daily every 30 minutes, and collect points which will take them to new levels and planets to claim valuable rewards. 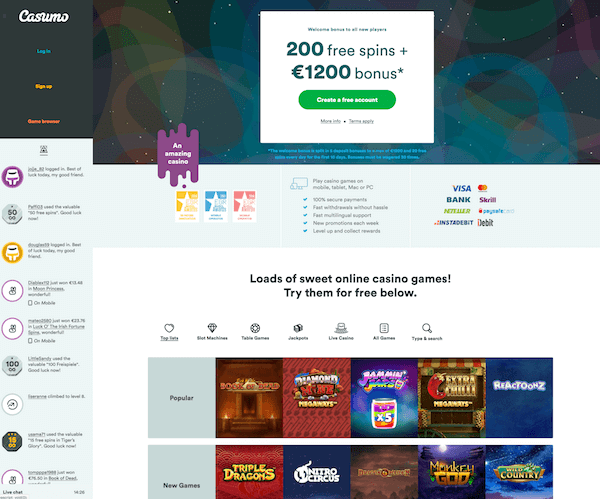 Casumo stocks over 1,600 casino games from about 30 different game studios, namely Microgaming, NetEnt, NYX, Play‘n GO, Yggdrasil, WMS, Big Time Gaming, Lighting Box, Blueprint Gaming, Bally, Barcrest, IGT, Quickspin, Rabcat, Novomatic, Merkur, Betdigital, Pragmatic Play, Push Gaming, Gamomat, Fuga Gaming, Shuffle Master, StakeLogic, Old Skool Studios, Stormcraft Studios, JFTW, Red Seven, Relax and Sthlm Gaming. Casumo is accessible via internet browsers and all games playable online. You can test them even without an account and check their respective RTPs on a list provided on the Casino’s website. To start your Casumo experience in style, the operator will offer a UK welcome package consisting of a deposit match bonus worth up to £300 and 20 free spins. The first deposit of up to £300 is matched 100%. The 20 Free Spins usable on Starburst. Deposits and credited bonus amounts must be wagered 30 times before asking for withdrawal and same goes for free spin wins. Slots contribute 100%, video poker 30%, Casino Hold’ Em, Oasis Poker and Txs Hold ‘Em Poker 10%, while bets on Ultimate Texas Hold ‘Em and any Baccarat, Roulette or Blackjack games don’t count at all. All other games contribute 100%. As long as bonuses are active, 50% of your bet will be sourced from your cash wallet and 50% from your bonus wallet. Limited filtering options might make finding your favourite slots a tad difficult, unless you search by name. If all else fails, one can browse through Casumo’s recommendations. List named “popular” displays titles such as Book Of Dead, Diamond Mine, Raging Rhino and Jammin’ Jars. On the one titled “Casumo loves”, you’ll find Danger High Voltage, Wolf Gold, Sakura Fortune and Reel Rush, while “Only at Casumo” presents, among others, Grizzly Gold and Kingdom Of Fortune. Grizzly Gold is a Blueprint Gaming product which pays 1,024 ways. Wild paw can multiply wins x2 or x3 during the base game and up to x27 in Grizzly Gold bonus round. Three or more Bonus icons launch up to 20 free spins with an opportunity to keep retriggering the feature till cows come home. Kingdom Of Fortune plays with Wilds capable of paying up to 100,000 coins. Scattered bonus symbols award free games with Wild multipliers of up to x16 and a little something called Royal Streak. The latter locks all winning symbols along with Wild multipliers while other positions re-spin, the same exercise continuing as long as additional matching symbols keep joining locked ones. 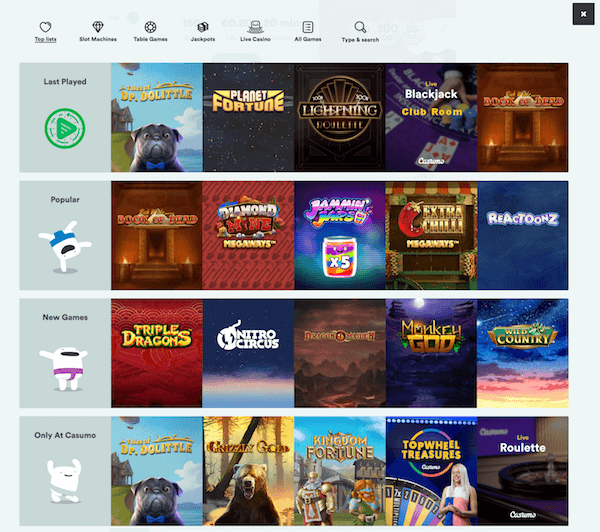 Casumo has chosen two top providers to furnish their Live Casino and tasked Evolution Gaming with developing exclusive Casumo games such as Topwheel Treasures, Live Roulette and Live Blackjack. Evolution additionally provides their usual Live Roulette range, including Lightning Roulette willing to pay up to 500:1 for a winning Straight bet, numerous Blackjack tables with limits to fit any budget, a variety of Baccarat games, Dream Catcher, Ultimate Texas Hold ‘Em, Caribbean Stud, Casino Hold ‘Em and Three Card Poker. You’ll also find Live Football Studio which combines a simple card game with live match commentary. NetEnt further boosts the choice of Live Roulette and Blackjack tables, making it easy to find a seat any time you choose to play. Casumo Mobile Casino provides an equally enjoyable gaming experience without bogarting your phone’s memory, but players can also download an iOS or an Android app if they prefer. Access Casumo online and you’ll soon find out it’s just as clean and user-friendly as the desktop version, which is why they boast EGR Nordic Awards: Mobile Operator 2017 title. Though the usual shrinkage typical for transitioning to smaller screens was expected, it seems there is little (if any) difference to the portfolio available on PCs. The operator accepts payments made in Euro and will accordingly convert funds before adding them to your balance. Payment options include those frequently featured in the online gaming world, namely credit/debit cards (Visa, MasterCard), eWallets (Skrill, Neteller), iDebit, Instadebit, PaySafeCard and Bank Transfer. Deposits are instant and free, no matter which of the above you choose. Minimum withdrawal amount is £10. There is no maximum cash-out limit, which is obviously a big plus. Casumo promises to review all withdrawal requests within 23 hours but will normally not take more than a few to process them. Casumo consistently receives raving reviews and it’s easy to see why. It offers fantastic games across different categories, uses engaging promotional mechanisms such as tournaments and missions, and pays out wins as quickly as possible without attaching max limits or charging fees. The team has managed to construct visually appealing yet simple and easy-to-use website which takes no time to master. Casumo ambassadors work round the clock to answer all enquiries and reputable regulators make sure everything is fair and above board.